In July of 2014, Colin Christopher had nearly completed an intensive 8-year Clinical Psychology program at Pacific University. He had recently started the final stage of the program, a residency. While driving to work, an uninsured driver ran a red light and T-boned Colin’s car at a busy intersection. Colin was only two minutes from his home in Portland, Oregon. 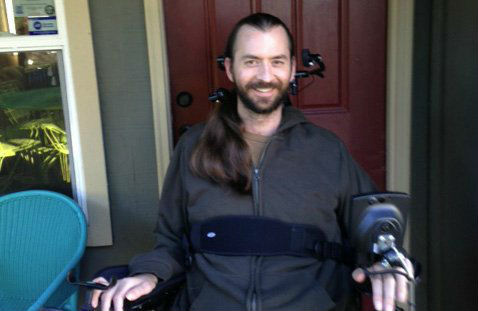 When Colin regained full consciousness a week after the accident, he learned that he had suffered from a C3, C4 spinal cord injury. 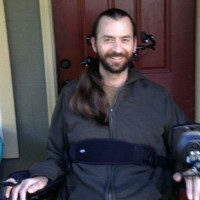 While he has full use of his head and shoulders, the rest of his body is paralyzed. Colin is gradually noticing more sensation in his arms and feet, and his fingers have some motion. He describes the motion he can achieve, however, as “clumsy,” and the sensation as a “global” one that allows him to distinguish pressure only. Colin lives with his wife, Emily, who he met while working. He is so grateful to the support that she and her family members have provided to him since the accident. Colin attends physical therapy twice a week in order to build his strength. In December of 2014, The Travis Roy Foundation awarded Colin a grant of $2,300 to buy a Hoyer Lift, which has made a tremendous difference in his life. The lift, a small crane on wheels, works like a sling, helping to transport Colin (who is 6′ 7″) to and from his wheel chair. Colin was recently able to travel to the coast with the lift, which is lightweight and easily transportable. Colin dreams of gaining independence and going back to work but is taking it one day at a time for now. He is so thankful for the Travis Roy Foundation, which he learned about from his aunt. He recognizes that while the lift is just one device, his daily reliance on it makes a big difference in the lives of he and his family.